Kerala: Before and After Floods- Talk by Dr.Alexander Jacob IPS (Retd) on 17/09/2018 at 7PM at Quilon Beach Hotel. 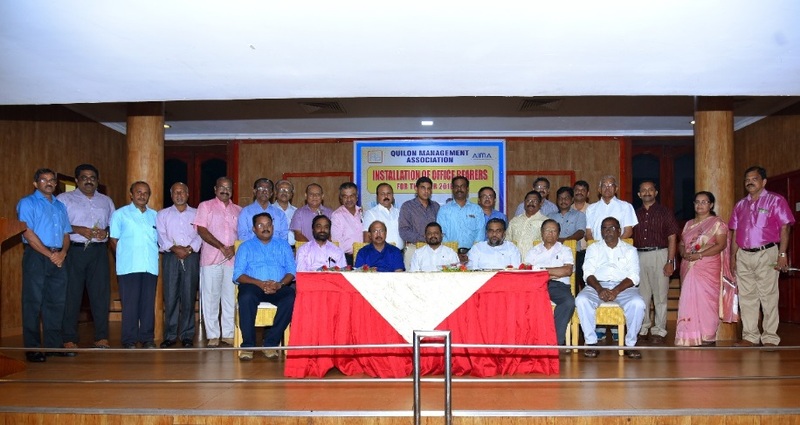 The installation of the office bearers of Quilon Management Association for the year 2018-19 was on 29-07-2018 at Quilon Beach Hotel, Kollam. Dr K S Radhakrishnan, former Chairman, Kerala Public service Commission and Former Vice Chancellor of Sree Sankaracharya University of Sanskrit is the Chief Guest of the day. The new team for the year 2018-19 are: 1 Dr.Riji.G.Nair President 9847076020**2. Dr.Sasidharan Pillai Vice President 9447752686**Mr.Sreeraj.C Secretary General 9447210251**4 Mr.Biju.K Secretary (Prog) 9446808243**5 Dr.Madhu C/o MSNIMT Secretary (PR) 9847435099**6 Mr.Sunilkumar.K Secretary (Admin) 9447093624**7 Mr.Jayachandran Treasurer 9447067290**8 Mr.K.V.Aravindakshan Executive Director 9447337660**9 Mr.Franklin Daniel (Ex Officio Member) Joint Executive Director 9447905180**10 Mr.Rajendraprasad. (Ex Officio Member) EC member 9496142303**11 Mr.Pradeepkumar Varma EC member 9446490570** 12 Mr.Sunil Kumar K EC member 9446590175**13 Mr.Harilal.T EC member 9496269329**14 Mr.Shukkur EC member 9446491790**15 Mr.K.G.Jacob EC member 9446333959**16 Mr. Salim Kumar K P EC member 9447801587** 17 Dr.B.S.Suran EC member 8861844442**18 Mr. Ratnakumar EC member 9745689923**19 Mr. Pramod P Mani EC member 9447720322 **20 Mr. Abdul Basith EC member 9895246454**21 Mr. Rajan Nair EC member 9447172666 ** 22 Mr. R.Sreekumar EC Member 9847076650**23 Dr.P.G.Mathew EC Member 9447095071**24 Prof. Shibu Krishnan EC Member 9446066302 ** 25 Dr.Harikumar EC Member 9447096448**26 Mr.Thaha EC Member 9446593771**27 Mr.T.K.Yohan EC Member 9847152245**28 Mrs. Sheeba Salim EC Member 9446047377**29 Mr.Shailakumar EC Member 9447720324** 30 Dr.Madhusoodhanan Pillai EC Member 9447065480. 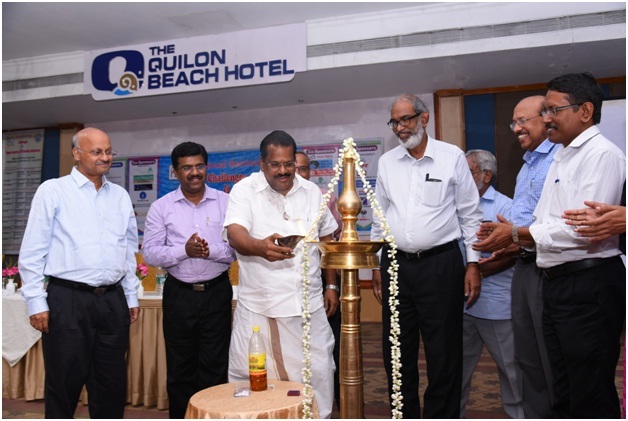 Quilon Management Association’s management convention was o 19th May, 2018 at Quilon Beach hotel, Kollam from 9.30 a.m to 4.30 p.m. The Theme of the convention: Opportunities and breakthrough to excellence. It focuses on developing personal power, dealing with turbulent times, and creating a culture of innovation, loyalty and competitive advantage, while fostering honest and open communication. Focusing on a theme of national importance, the annual Convention, which is the flagship event of QMA seeks to generate an invigorating debate on the subjects a) Mineral Industries, b) Tourism c) Skill development. Through this, QMA provide a national forum for the management community to discuss and recommend policy options in specific areas of management. The convention aims at equipping participants with an understanding and appreciation of the need and challenges to grow and sustain in the liberalized economy Dr. Riji G Nair, Convention Chairman & Vice-President of QMA welcomed the gathering. The Presidential Address given by Er. P.Rajendra Prasad, President of QMA. The Sri. P. Sreeramakrishnan, Hon’ble Speaker of Kerala Legislative Assembly, inaugurated the convention. and distributed the awards to the winners. QMA Life Time Achievement Award - 2018 received by Shri. M. Chandradathan , Former director VSSC & Scientific advisor to Chief minister and QMA award for Best performing large scale public sector company in Kerala – 2018 to The Kerala Minerals and Metals Ltd . QMA Management Leadership award – 2018, received by Dr. John Daniel ,Managing Director of St. Johns Group of Higher Secondary Schools. QMA Best Technical Institution Award – 2018 received by the Institution of Engineers (India) Kollam Local Centre. QMA Management Excellence award in life care – 2018 was to Dr. Sumithran Gangadharan, Chairman and Chief Cardiothoracic surgeon of Padmavathy Medical Foundation, Kollam. QMA Management Excellence award in Service Sector – 2018 was to Dr. C.S. Sajan., Director of Kailas Super Specialty Dental Clinic and Implant Centre, Kollam. QMA Entrepreneur Excellence award – 2018 was to Shri. G.Vasantha Kumar, Managing Director of Sauparnika Export Enterprises Kollam. QMA Woman entrepreneurial Excellence award - 2018 received by Smt. Hina Mohandas., Managing Director of Vijay Seals and Royal Seals Pvt. Ltd. QMA Best Management Student award – 2018, received by Ms. Renju Chandran , Mar Thoma Institute of Information Technology, Ayoor, Kollam. On behalf of all the award winners Dr. John Daniel addressed the audience. Office bearers and Executive committee members with . Mr.A. Hemachandran IPS, Director General, Kerala Fire and Rescue Services, Sri. K Rajendran Nair, I A S ,Retired, Former Secretary, Govt. Of India and Mr.Roy Kurian.K.K, Managing Director, KMML. The installation of office bearers for the year 2017-18 was held on 27/07/2016. Mr.A. Hemachandran IPS, Director General, Kerala Fire and Rescue Services, Sri. K Rajendran Nair, I A S ,Retired, Former Secretary, Govt. Of Indiaand Mr.Roy Kurian.K.K, Managing Director, KMML and Patron QMAwere the guests for the event. The office bearers of the year 2017-18 are: President - Sri. P. Rajendraprasad, Former JGM –KMML and Former MD,TCL, Vice President - Dr. Regi G Nair, Former MD, Cosumer fed, Secretary General – Sri. Franklin Daniel, Chief Manager & HOD (Quality Control), Indian Rare Earths Ltd, Secretary Program - Dr. J. Sasidharan Pillai, Former Chief Internal Auditor, KSEB, Secretary Public Relations – Dr. Madhu. R, Vice Principal ,MSNIMT, Secretary Administration - Sri. Abdul Shukur, Former Manager, IREL, Treasurer- Sri. Pradeepkumar Varma, Former Manager, MILMA. Executive committee members of QMA for the year 2017-18 are: Sri. C. Sreeraj, Dy. Manager, KMML & Immediate past Secretary General, Dr. P G Mathew, Past President , K.G. Jacob, Rtd Manager, IREL and Past President QMA, K.V.Aravindakshan, Former AGM, KMML & Executive Director of QMA, Sri. Thahakunju, Officer Finance, IREL & Past Treasurer, Sri. T. Harilal, Rtd Manager, KEL, Sri. 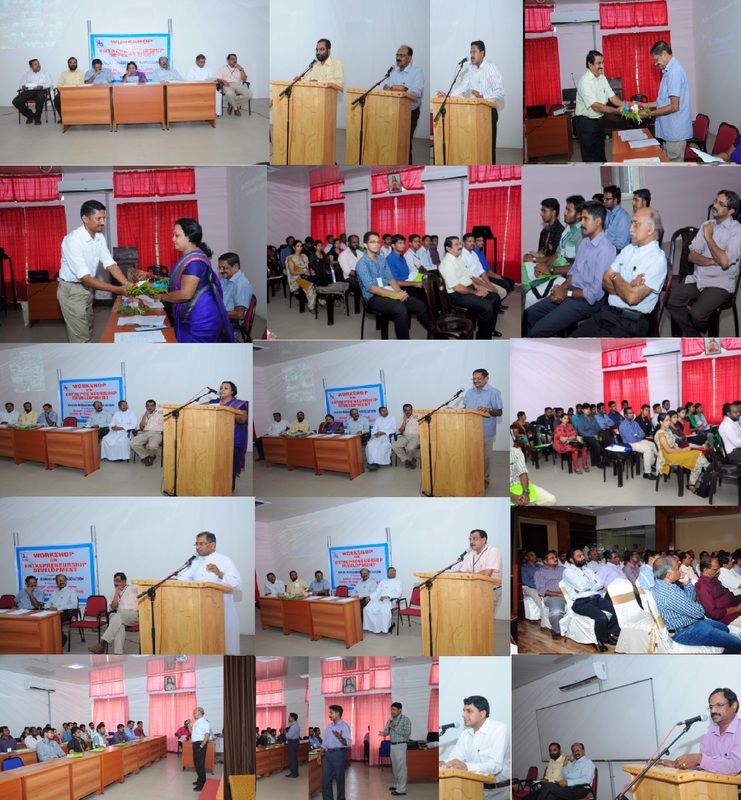 Shylakumar, DGM Finance, KMML, Dr. Harikumar, Prof & HOD Chemistry Dpt, TKM College, Sri. Jayachandran, Manager finance Indian Resins and Polimers, Sri. Sibu, Asst. Prof. College of Engg, Tvm, Sri.K. Sunilkumar, Chief Manager, IREL, Sri. Jerry Joseph, Manager, KMML, Sri. Rajan Nair, MD, Poilakada Fisheries, Sri. Mohamed Zakeer, Asst.Prof. TKM College of Engg, Sri. Sreekumar, MD, Beach Hotel, Kollam, Sri. G.Vasanthakumar, Chief Executive, Africa Products Ltd, Sri. Ratnakumar, Sr. Manager UEIL, Sri. Biju. K. Asst.Prof. College of Engg, Munnar. Sri. Harikrishnan R Nair, CEO, Western India Cashews. 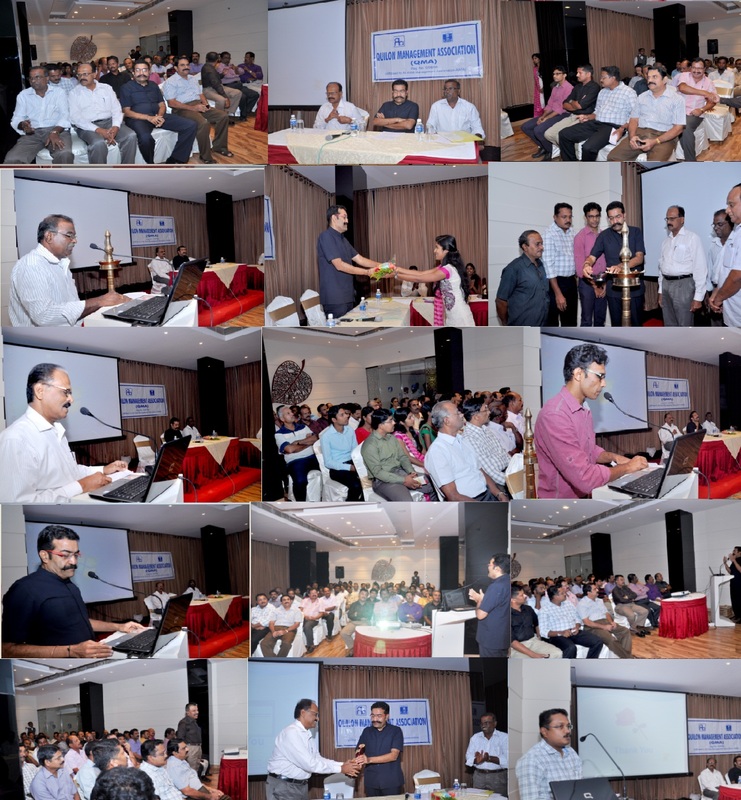 Quilon Management Association (QMA) Jointly with The Institution of Engineers (India), Kollam Local Centre (Chemical Division Board of IEI) talk on the topic **Creation of Start up Systems in Kerala and Challenges ** on 1st August at Kollam Beach Hotel. Sri P H Kurian I A S, Principal Secretary (Revenue), Govt. Of Kerala was the chief guest. 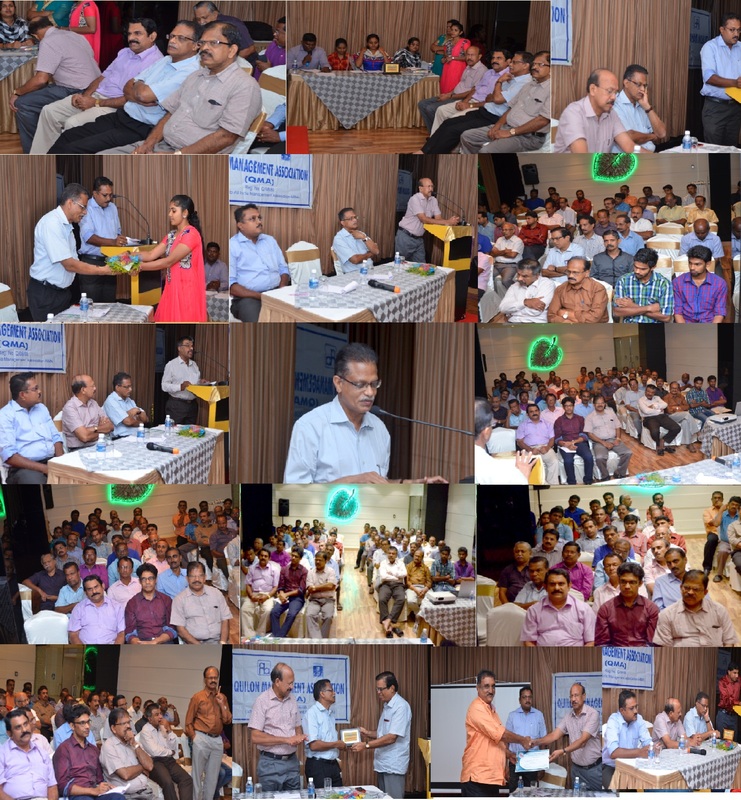 The Institution of Engineers (India), Kollam Local Centre (Chemical Division Board of IEI) in association with Quilon Management Association (QMA), organized All India seminar on the topic **Challenges & Opportunities of Titanium Industries** from 22nd July 2016 to 23rd July 2016 at Kollam Beach Hotel. 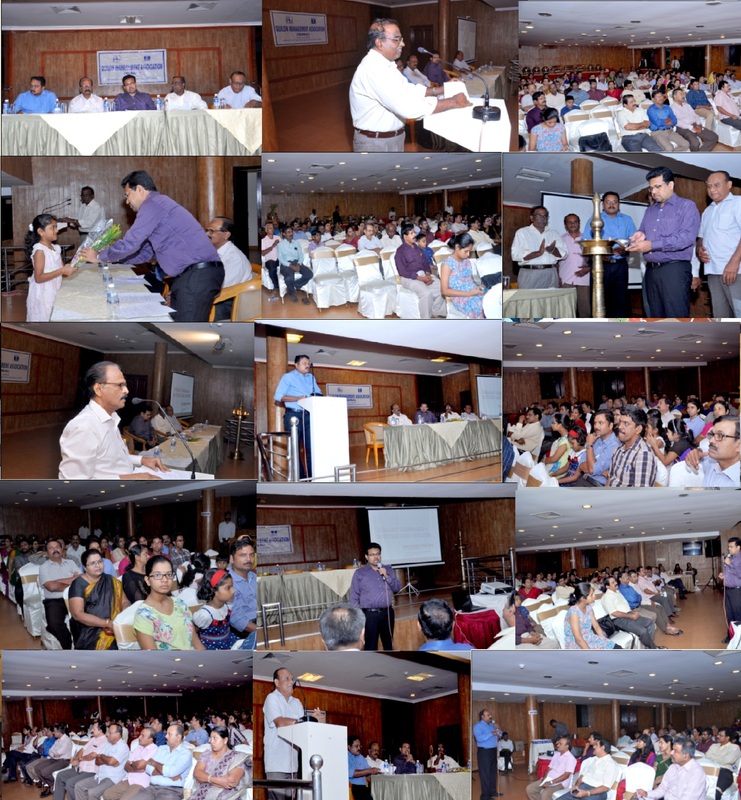 The Quilon Management Association arranged a program on 25th April 2016 at Quilon Beach Hotel. The topic was ***Heartfulness meditation – Sahaj Marg Meditation***by Dr. Jagadesh, Former DMO of Kollam. 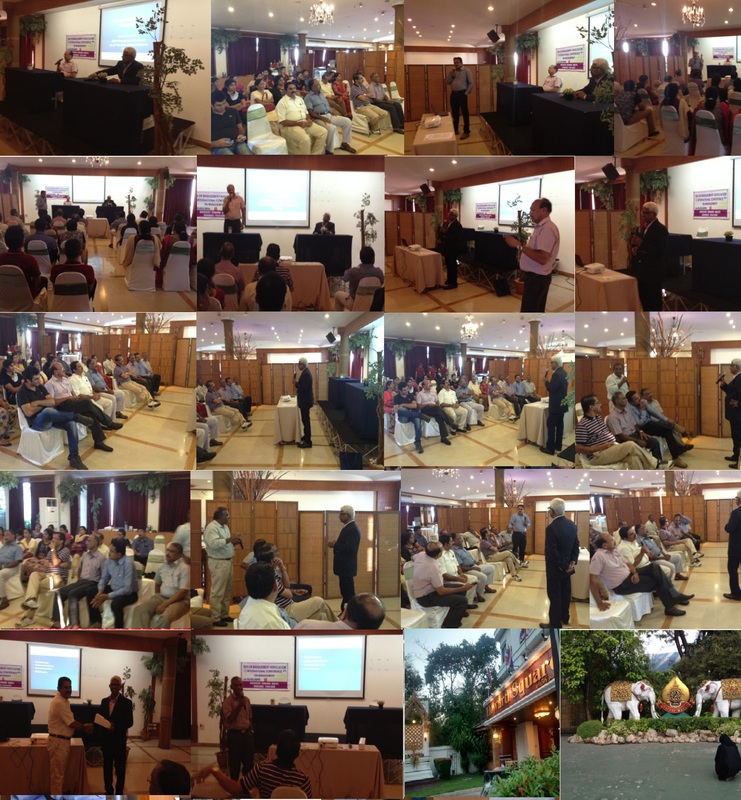 The Quilon Management Association organized international conference at Bangkok on 12th February, 2016. In the conference Sri B. Ajay Kumar, Professor and Head, Department of Business Administration, Rajadhani Institute of Engineering and Technology, Trivandrum presented a paper on FOREIGN DIRECT INVESTMENT AND ECONOMIC DEVELOPMENT IN INDIA – AN EMPIRICAL ANALYSIS. 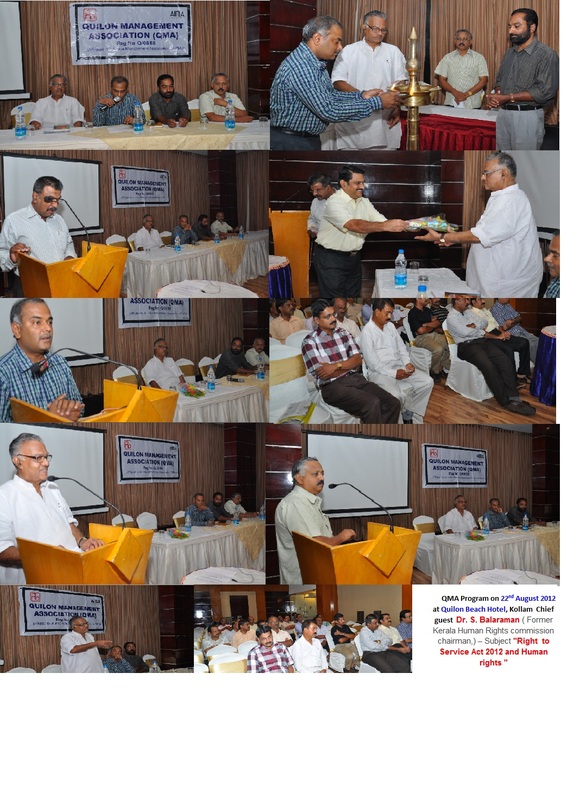 The Quilon Management Association arranged one day workshop as part of Management Development Program on 17th December, 2015. Dr. K. Gopakumar, Faculty of law, Gulati Institute of Finance and Taxation, Thiruvananthapuram was the faculty of the workshop. 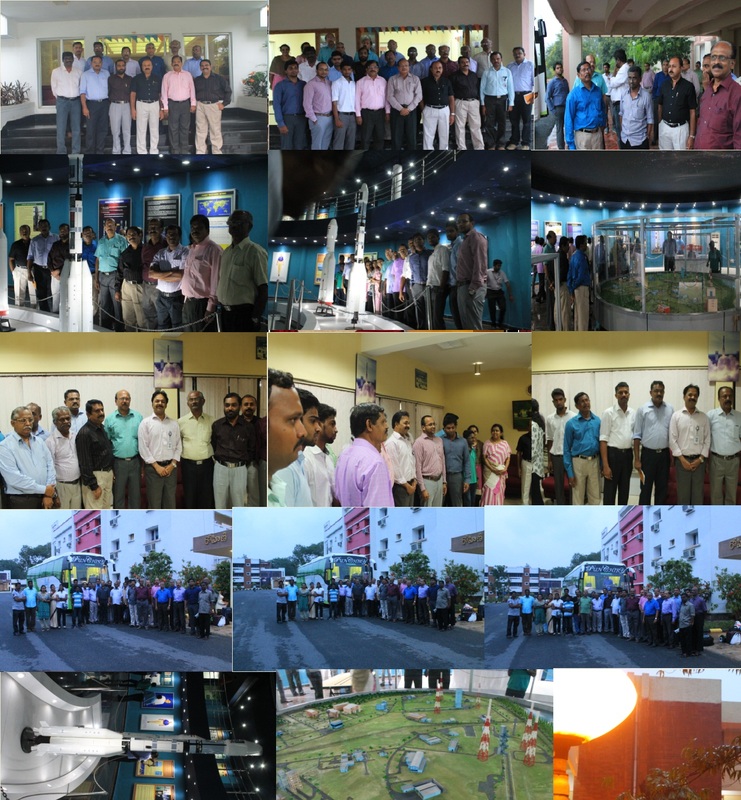 The Quilon Management Association arranged a visit on 12th November 2015 to the Satellite launching station of ISRO. With the coordination of Padmasree Dr.M C Dathan, former Director of VSSC and ISRO, members of QMA got the unique opportunity to visit the prestigious satellite launching station of India. 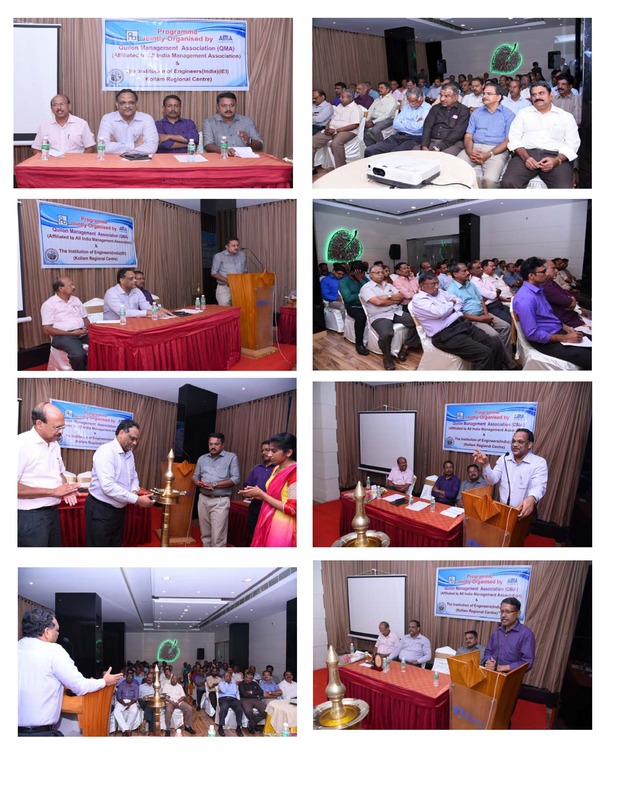 The Quilon Management Association Jointly with Institution of engineers India Kollam chapter conducted a panel discussion on the subject ******Cashew Industry - Challenges and Opportunities***** on 19th October, 2015 at Kollam Beach Hotel. 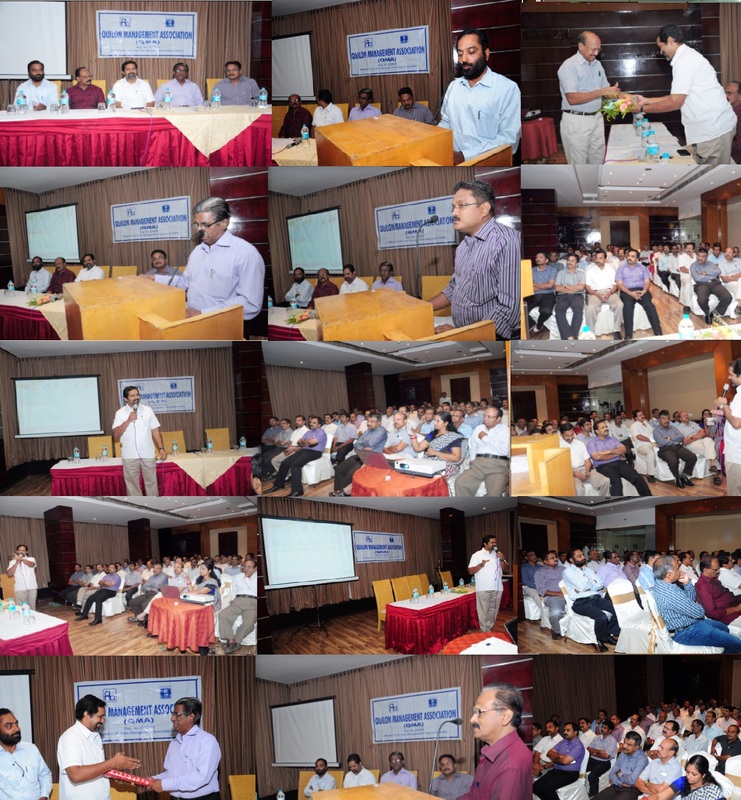 The Quilon Management Association Jointly with Institution of engineers India Kollam chapter conducted an interactive workshop on *******Quality Education***** on 8th August, 2015 at Kollam Beach Hotel. 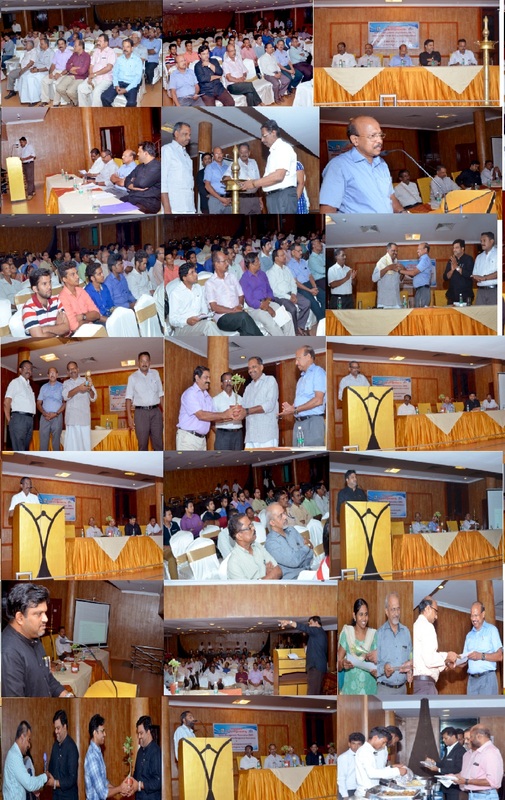 The Quilon Management Association organized a talk on **Media and Society** on 31st July, 2015 at Kollam Beach Hotel. The speaker was Mr. C Gouridasan Nair, Kerala Bureau Chief, The Hindu Daily. The office bearers and EC members with Padmasree Dr.M C Dathan, former Director VSSC and ISRO. Rajendraprasad.P -President, Devakinandanan - Vice President, Sreeraj.C -Secretary General, Dr.R. Madhu	Sec. Administration, Harilal.T - Secretary Programmes, Mr. Muhammed Zakker - Secretary PR, K.M.Cheriyan - Treasurer. 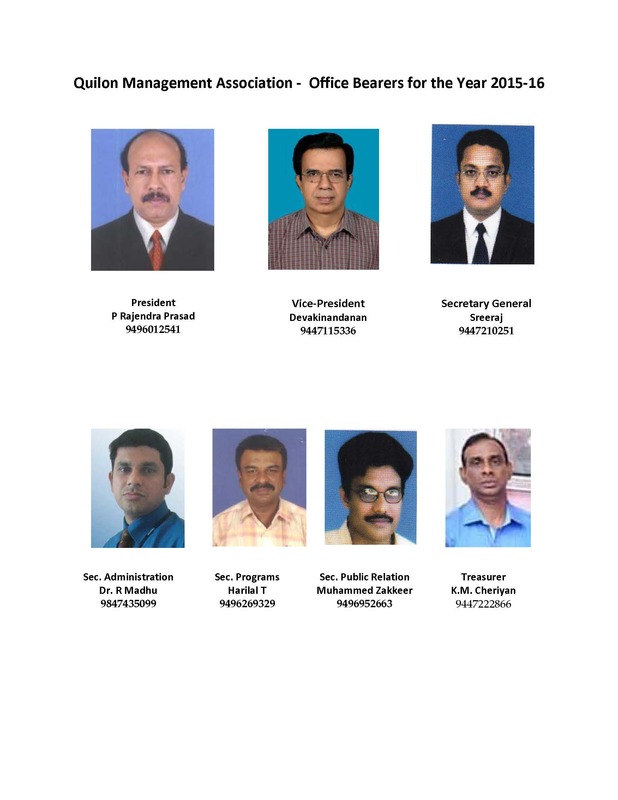 E C Members - H.Reghudas, Balamuraleekrishnan.C, P.G.Mathews,Vikraman Nair, Thaha Kunju, Jayachandran.G, Syamkumar, Prof.Madhusudanana Pillai, Dr.J.Sasidharan Pillai, K.G.Jacob, Appukuttan, Franklin Daniel, Rajan Nair, Shaju. V, K.V.Aravindakshan, Vasathakumar, Sreekumar, Jnaneswar, K P Ramachandran Nair,Hina Mohandas. 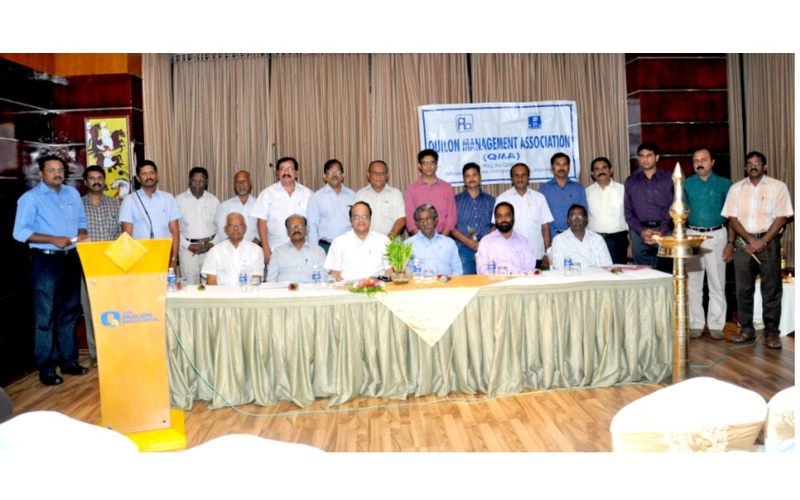 The installation of office bearers of Quilon Management Association was on 30th June 2015. 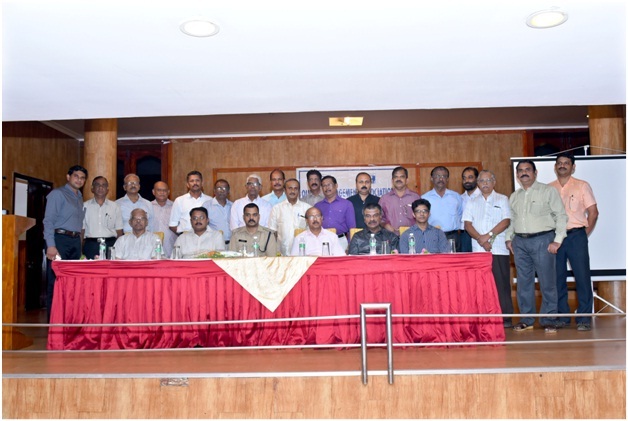 Padmasree Dr.M C Dathan, former Director VSSC and ISRO was the chief guest. The newly elected office bearers and executive committee members are Rajendraprasad.P -President, Devakinandanan - Vice President, Sreeraj.C -Secretary General, Dr.R. Madhu	Sec. Administration, Harilal.T - Secretary Programmes, Mr. Muhammed Zakker - Secretary PR, K.M.Cheriyan - Treasurer. E C Members - H.Reghudas, Balamuraleekrishnan.C, P.G.Mathews,Vikraman Nair, Thaha Kunju, Jayachandran.G, Syamkumar, Prof.Madhusudanana Pillai, Dr.J.Sasidharan Pillai, K.G.Jacob, Appukuttan, Franklin Daniel, Rajan Nair, Shaju. V, K.V.Aravindakshan, Vasathakumar, Sreekumar, Jnaneswar, K P Ramachandran Nair,Hina Mohandas. 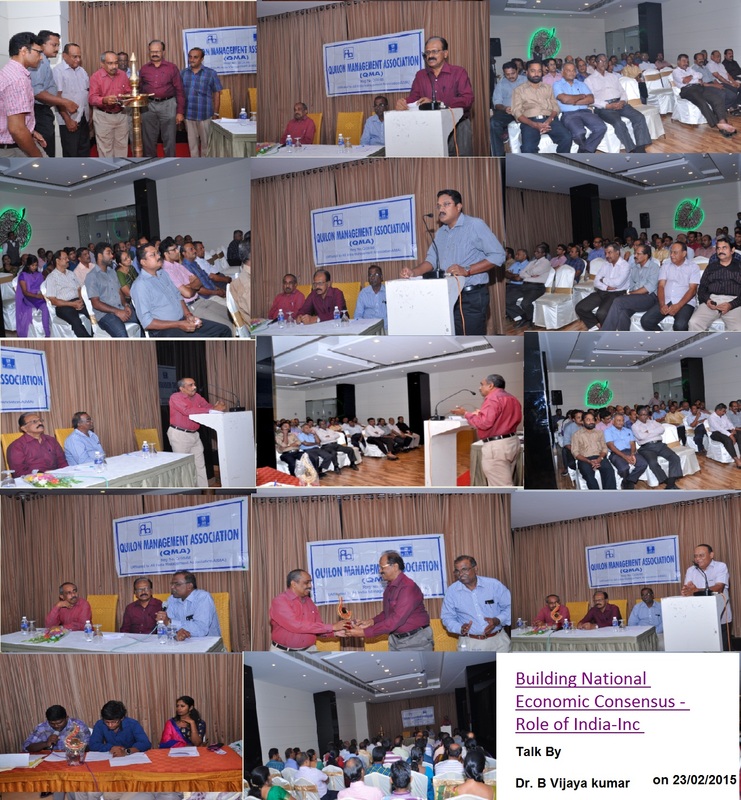 QMA Program on 23/02/2015 Building national economic consensus - role of India inc. 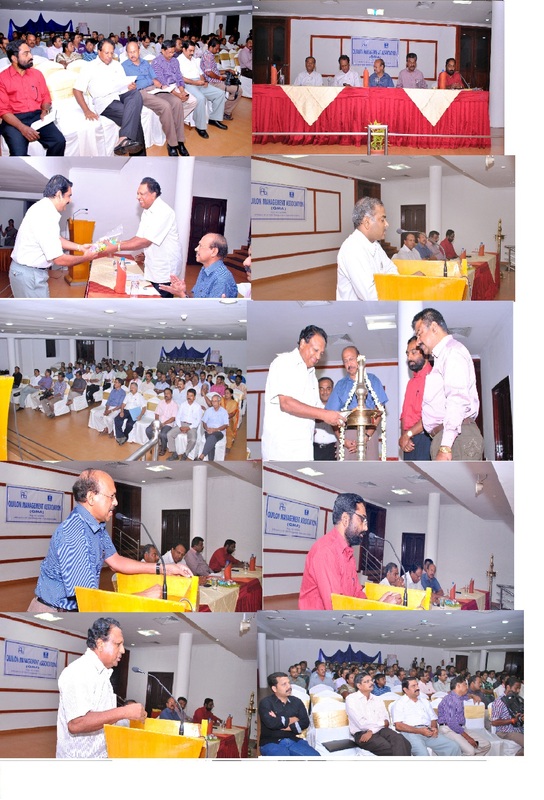 Installation of the office bearers for the year 2014-2015 on 09/07/2014 at Quilon Beach hotel. 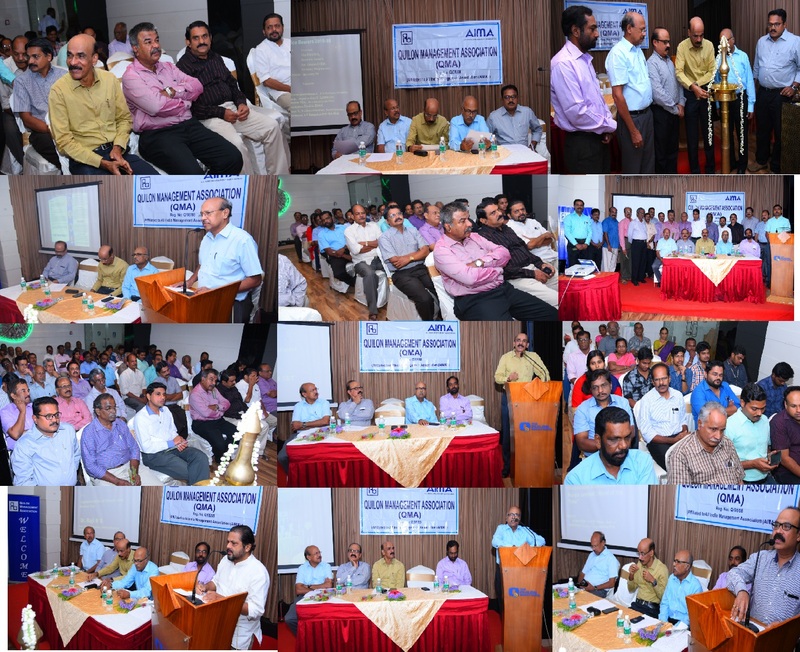 Mr.K.G.Jacob- President Mr.Rajan Nair- Vice President Mr.Sasidharan Pillai- Secretary General Mr. Abdul Shukkor -Secretary (Programmes) Mr.Muhammed Zakker -Secretary (Public Relations) Mr.Sreeraj.C- Secretary (Administration) Mr.Thaha- Treasurer Executive Committee members - Dr.P.G.Mathews, Mr.Shaila Kumar, Mr.Franklin Daniel,Mr.Sanjay Singh Lonia, Mr.NM.Salim, Prof.Madhusudanana Pillai , Mr.K.V.Aravindakshan,Mr.Mohanan Pillai, Dr.R.Madhu Mr.T.K.Yohan Mr.Janeswar, Mr.Sreekumar, Mr.Premachandran Nair, Mr.Manoj Nair, Mr.Jayacahnadran, Mr.R.Sreekumar, Mr.Deepu Mr.Sunil Kumar. With Prof. V.N. Rajasekharan Pillai, Ex-Officio Principal Secretary, Science and Technology Department. 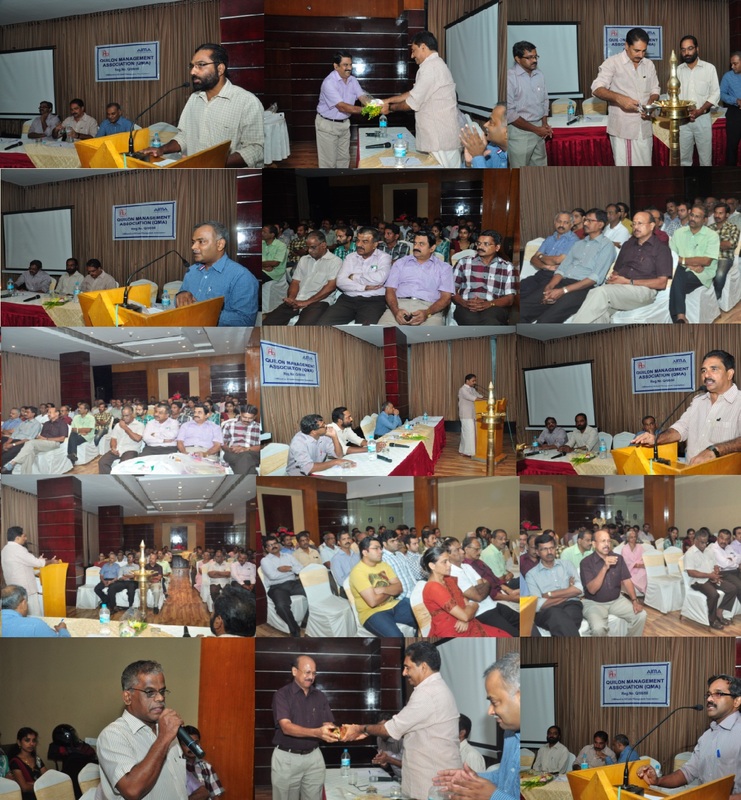 The Quilon Management Association conducted a program on the subject **Integrated Transport System with special reference to Kollam City *** on 5th August, 2014 at Kollam Beach Hotel by Sri Elangovan, Scientist- G and Head, Traffic and Transportation Division, National Transportation Planning and Research Centre, Thiruvananthapuram. Officer bearers for the year 2013 -14. President	Dr. P.G.Mathews Vice President Sri. K.G.Jacob. Secretary General,	Sri. Franklin Daniel. Secretary (Admin)	Sri.C. Sreeraj, Secretary Programs	Sri. Madhu R. Secretary (Public Relations)	Sri. T.Deepu, Treasurer	Sri. K Ravi. Executive committee members: Mr. K.V. Aravindakshan, Mr.P.Rajendraprasad, Mr.K.Sirish, Mr. Mohammed Zakhir, Mr.Shylakumar, Mr.Vasanthakumar, Mr.R.Sreekumar, Mr.P N Appukuttan, Mr. Suresh Babu, Mr. Shaji, Mr. R. Madhu, Mr. N.M.Salim, Mr. Gopal Sahoo, Balamuraleekrishna, Sunil Kumar,Dr. Kevin, Mr. Rajan Nair, Mr. Prasannan, Mr. Harikrishnan, Mr. Madhusoodanan. 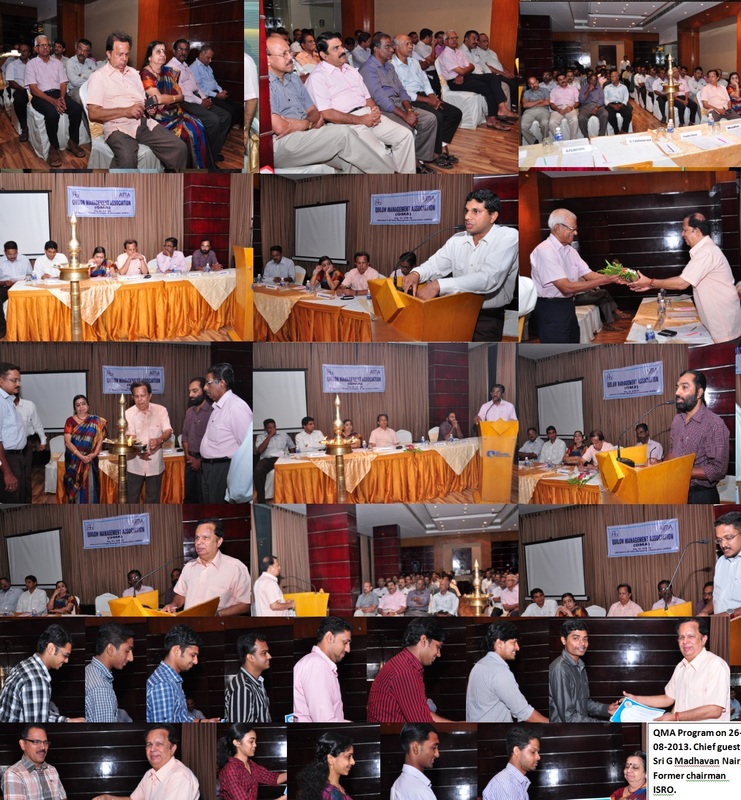 Successful Investment Strategies ************ QMA organized a program on 24- May 2013 at Kollam Beach Hotel. 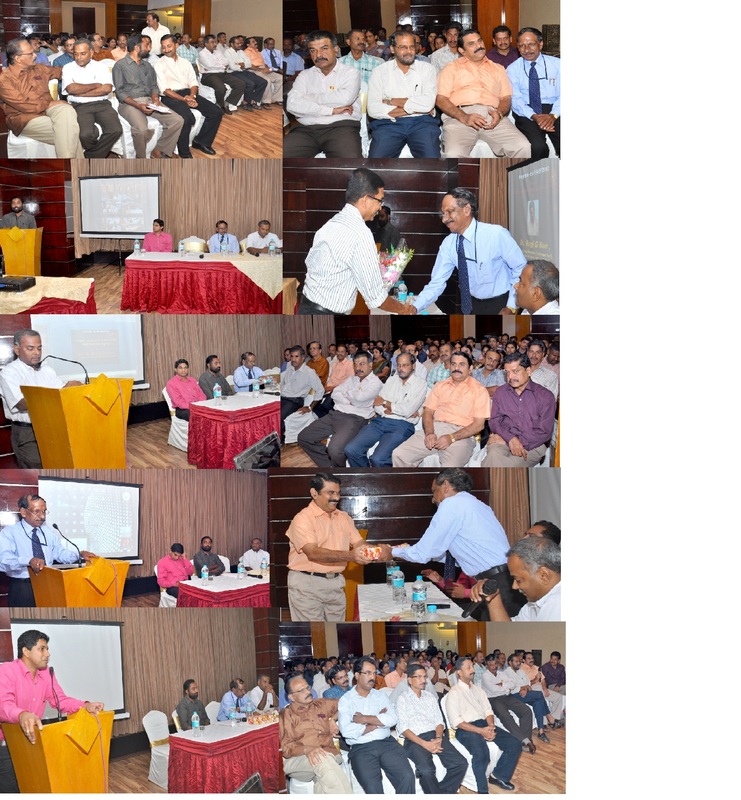 The program was a talk on ******Successful Investment Strategies****** by Sri.K.P.Abraham, AGM, Corporate Office-Muthoot Fianance Ltd. and Sri. Rajesh, Regional Manager- Muthoot Securities Ltd, Trivandrum. 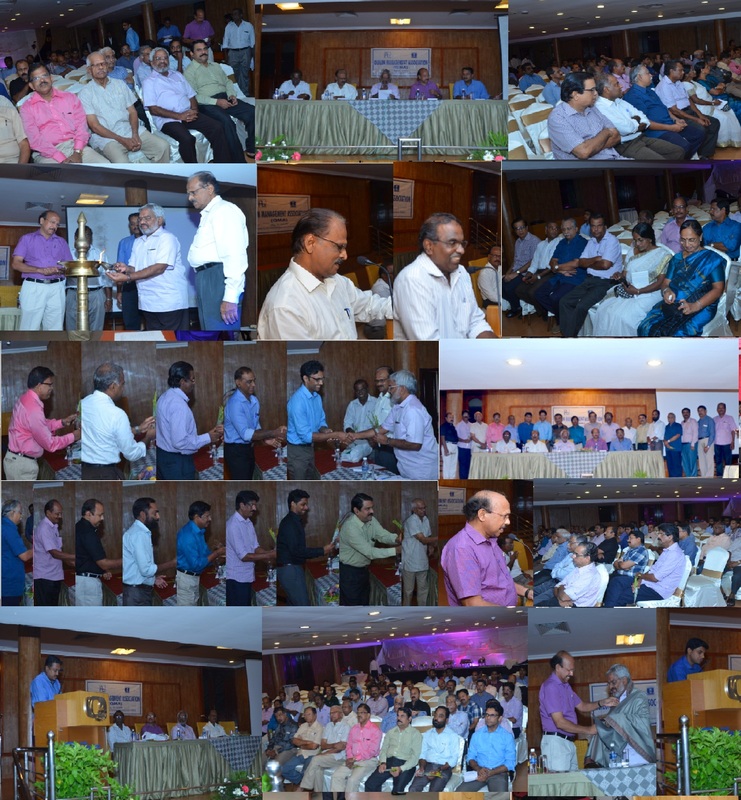 A discussion titled ******Water Crisis-an agenda for action****** was organized by Quilon Management Association on 6th May, 2013 at Beach Hotel and convention centre, Kollam. Mr.N.K..Premachandran, former minister for Irrigation and Water resources led the discussion. 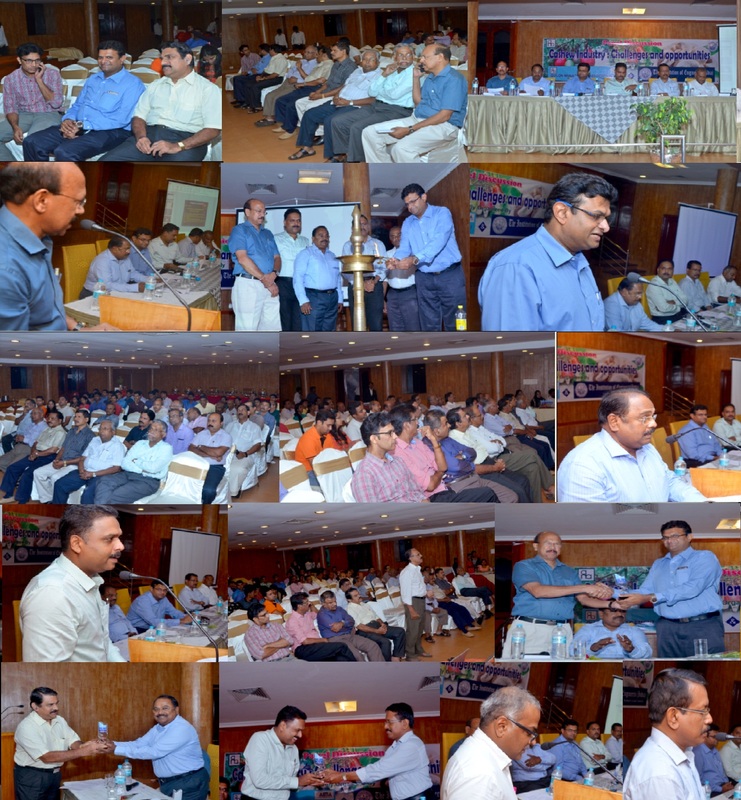 QMA organized talk on the subject ****Current trends in General Insurance**** by Mr.C.R.Vijayan, Chief, Oriental Insurance Company, Regional Office-Kochi on 27th September,2012. 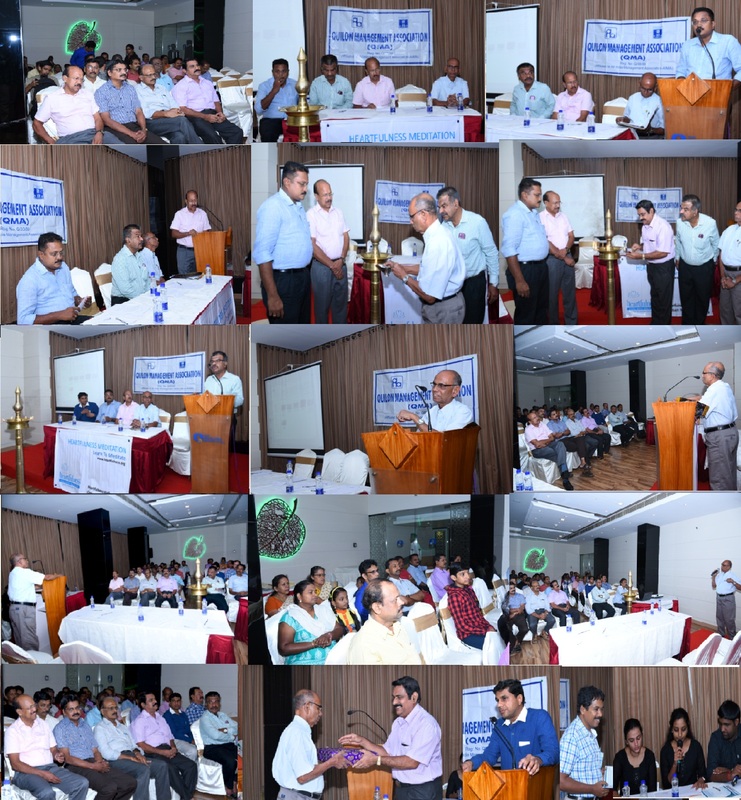 The Quilon management association conducted its first meeting of the year 2012-13 on 7h July, 2012 at Quilon Beach Hotel and Convention Centre. 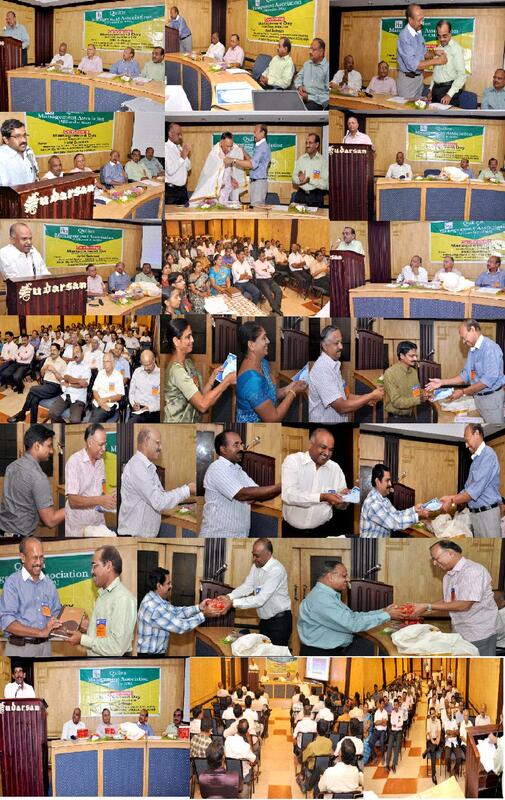 The installation of the office bearers for the year 2012-13 and talk by Sri. Dr. K.Jayakumar. 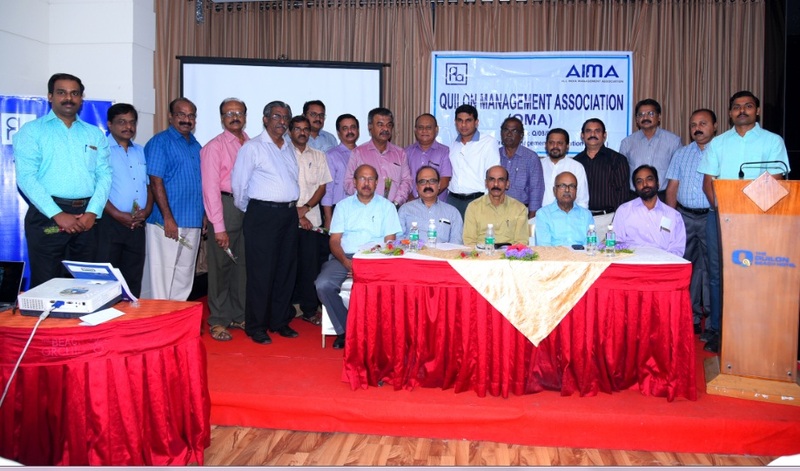 I.A.S (Chief Secretary of Kerala) on the subject****Management of Public Enterprises**** was the first event of QMA for the year 2012-13. 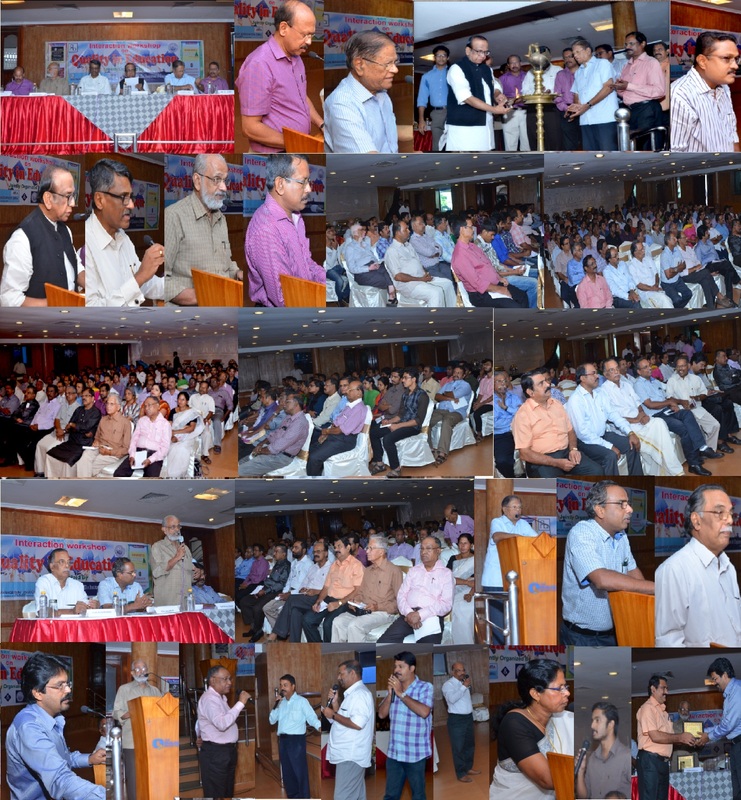 On 25/08/2011 QMA organized a talk on*****India-US strategic alliance in the changing global order**** and the speaker was Sri T.P.Sreenivasan, Former Ambassador. 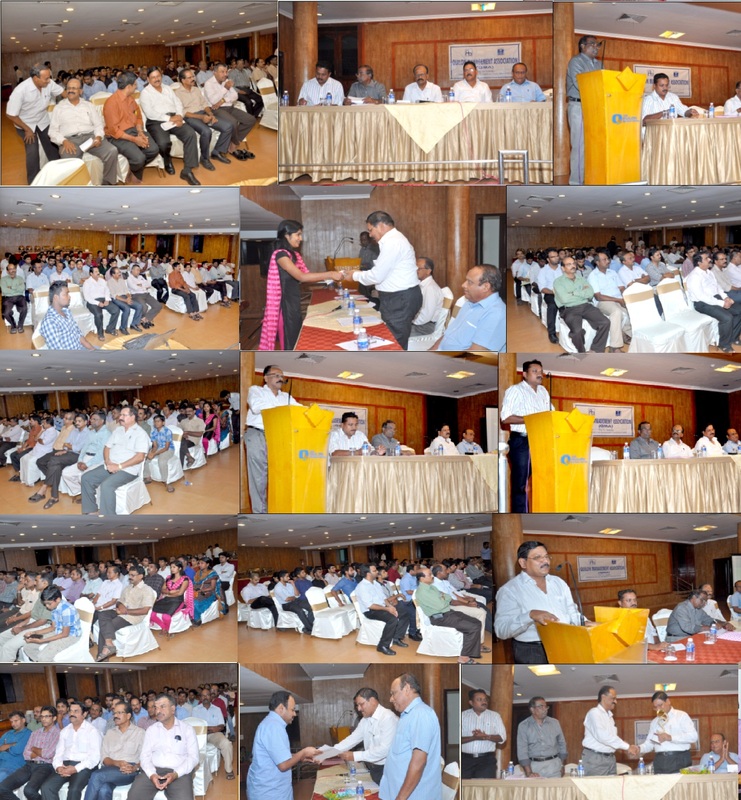 On 15/07/2011 QMA organized a talk on Labour Policy by Shri. Shibu Baby John, Hon’ble Minister for Labour & Rehabilitation. 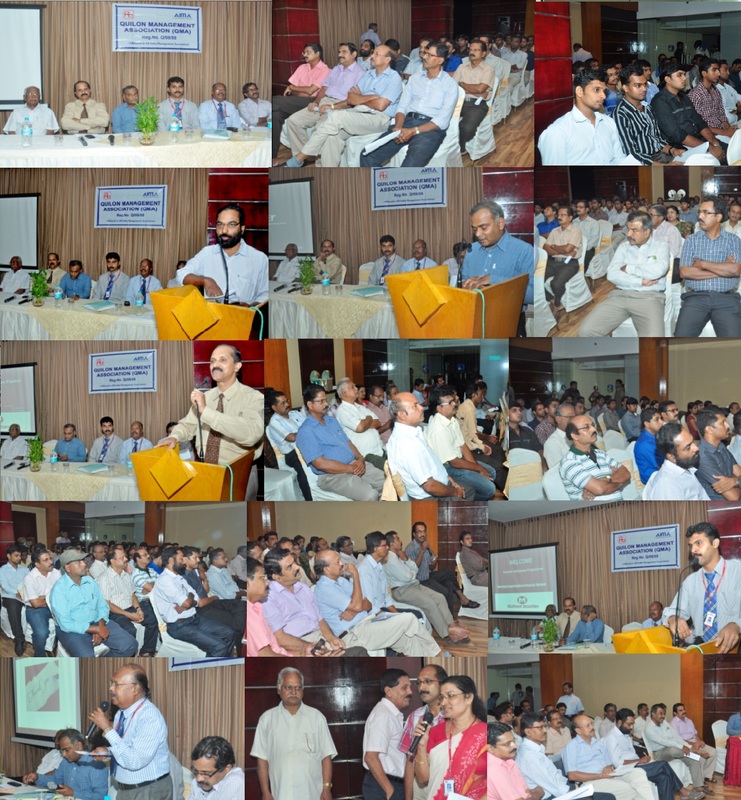 On 28/06/2011 QMA organized a talk on ***Quality Management Systems – A Strategic business Tool. *** The speaker was Sri. S. Lokanathan, BE (Mech), MBA(Marketing). General Manager, Operation and Business in South India, Sri Lanka and Maldives of TUV (a leading certification and inspection agency across the globe). QMA programe on 18 March, 2011 Chief guest Sri. Prabhat Patnaik, Vice-Chairman of the Planning Board of Kerala. 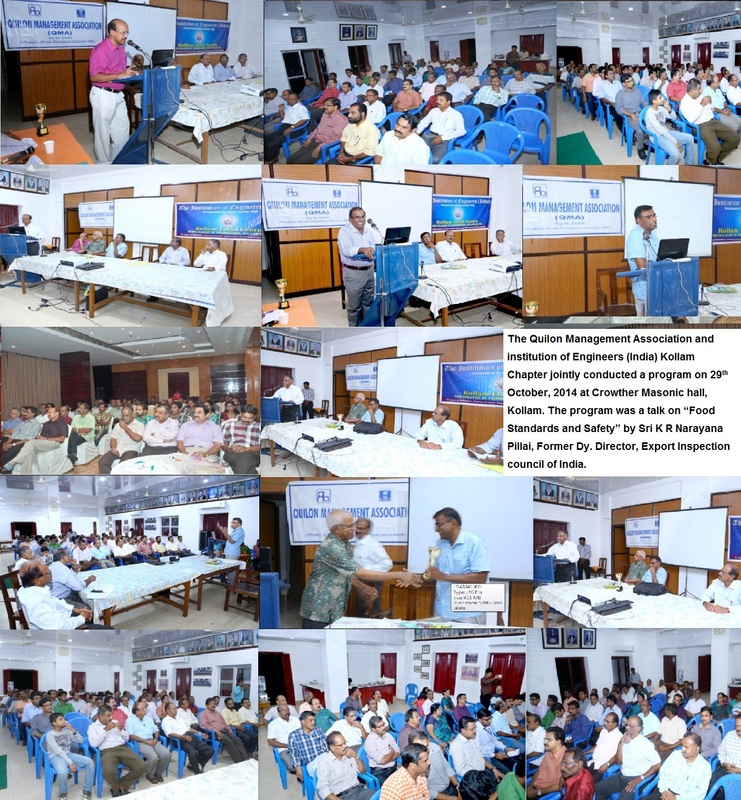 QMA Program on 14 March, 2011 - Talk by Sri.S. Ramnath, Managing Director, KINFRA - Development of Industrial infrastructure in Kerala. Q M A program - Talk on 25/01/2011 by Sri. 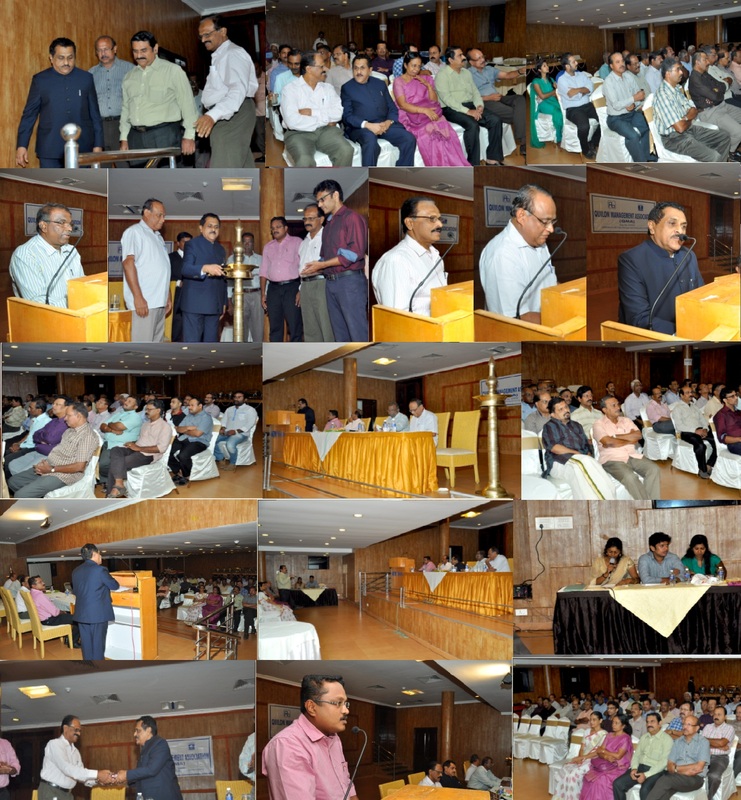 T.Balakrishnan IAS, Additional Chief secretary (Industries and Commerce) at Hotel Beach Orchid, Kollam. 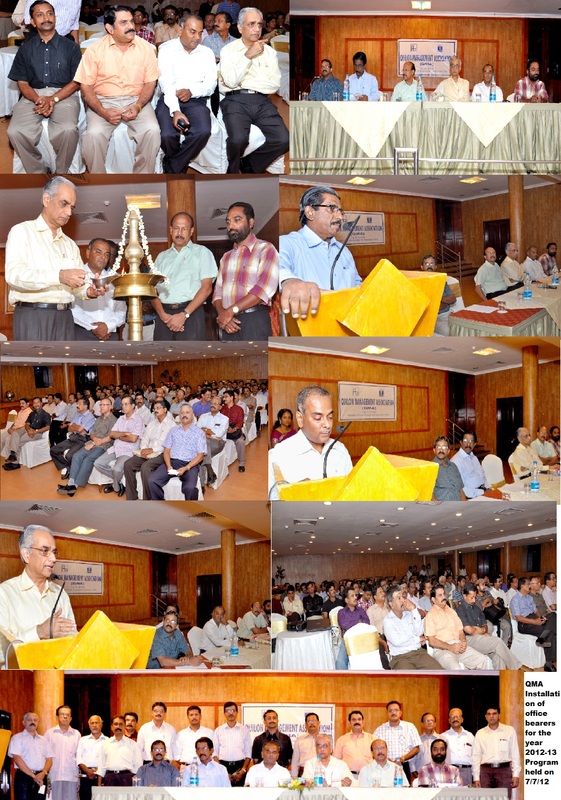 Programe on 26/11/2010 a talk on Mind Power by Dr. P.P.Vijayan at Hotel Beach Orchid, Kollam. 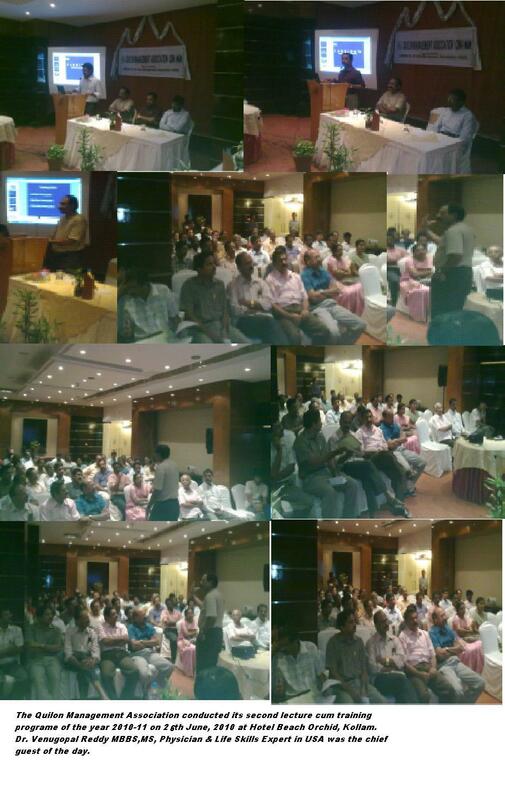 The QMA conducted a talk on on Trauma Care & Spine and Back Pain by Dr. Thomas Varghese, MS., Mch., Consultant Sr. Neurosurgeon, SIMS And Bishop Benziger Hospital, Kollam on 29/09/2010 at Hotel Beach Orchid, Kollam. 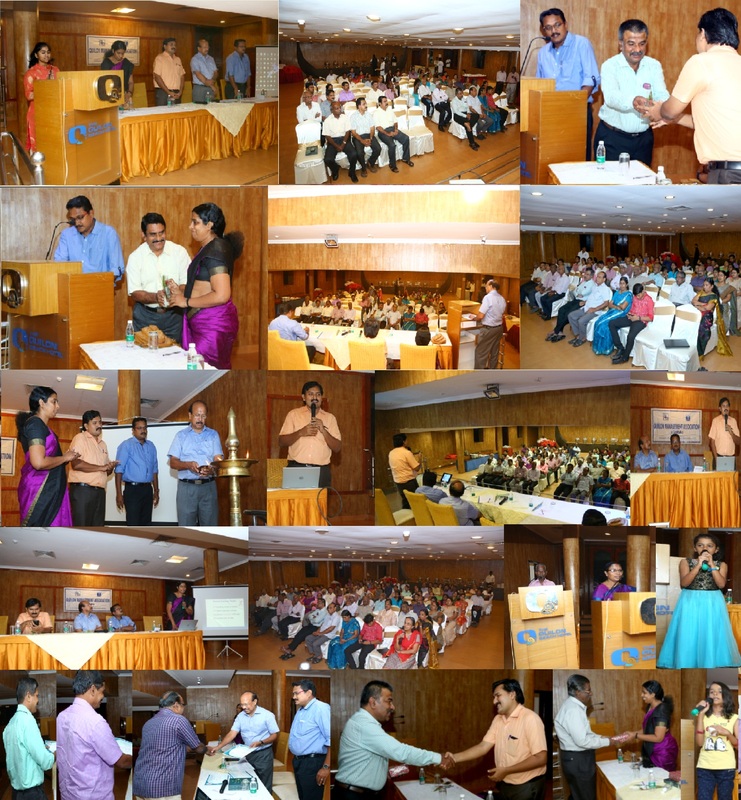 Think Smart - The Quilon Management Association programe conducted on 28th June, 2010 at Hotel Beach Orchid, Kollam. 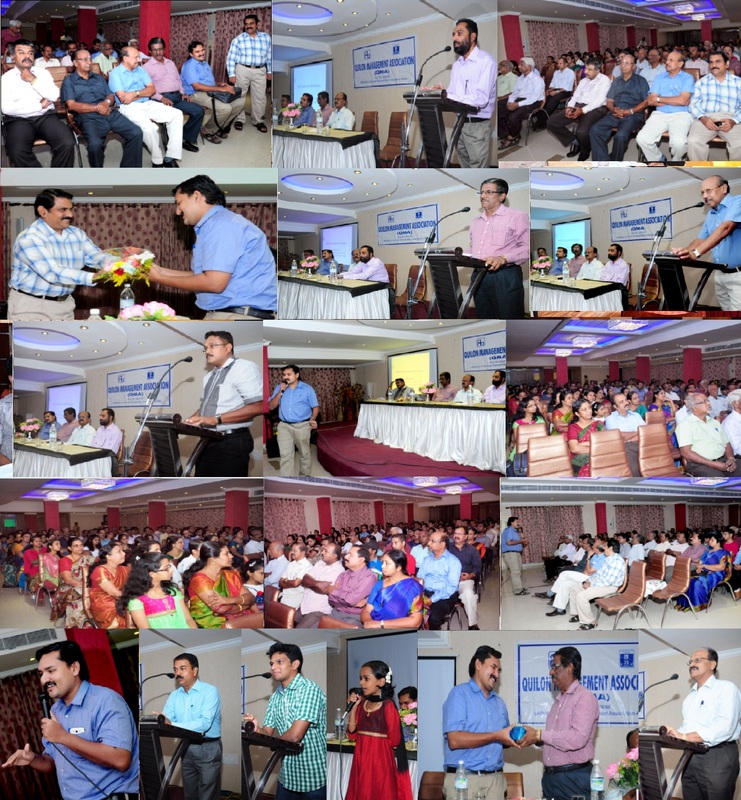 Dr. Venugopal Reddy MBBS,MD, Physician & Life Skills Expert in USA was the chief guest of the day. 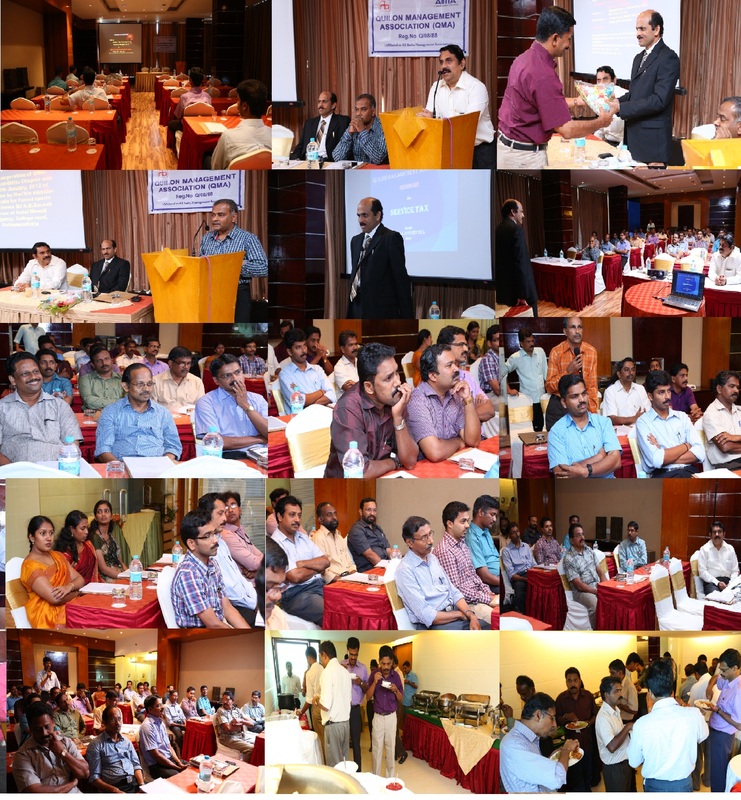 The Quilon management association conducted its first meeting of the year 2010-11 on 3rd June, 2010 at Hotel Beach Orchid, Kollm. 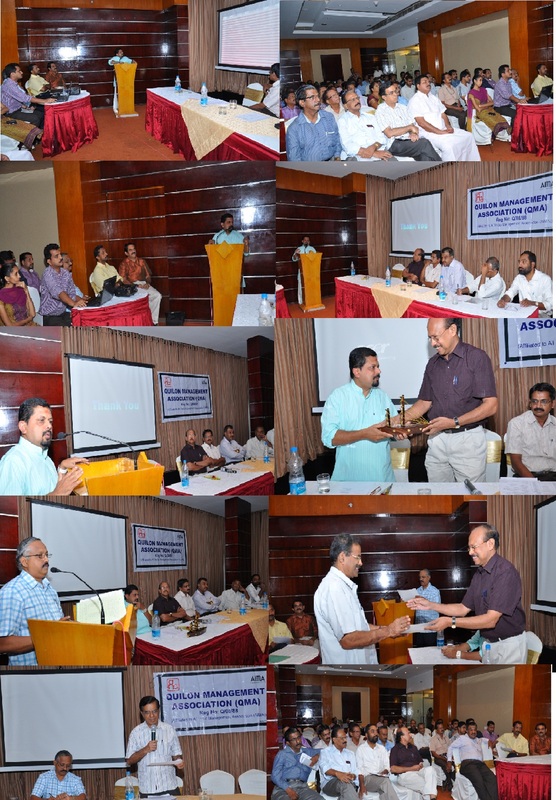 The installation of the office bearers for the year 2010-11 and talk by Sri. 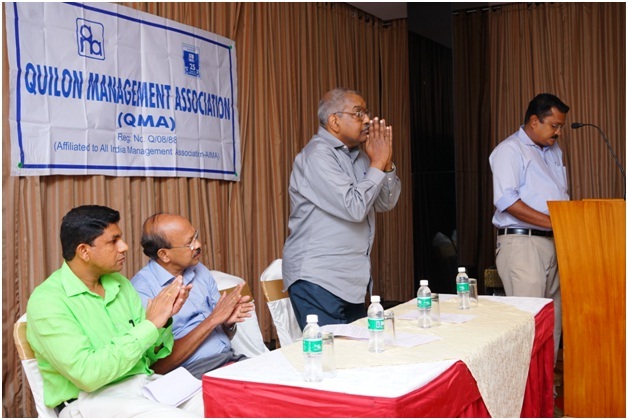 M.Ayyappan, CMD Of Hindustan Life Care Limited was the first event of QMA for the year 2010-11. Best Industry,Best Management Student award function on 31st March, 2010. Inauguration by Sri Oommen Chandy, Leader of Opposition, Kerala. 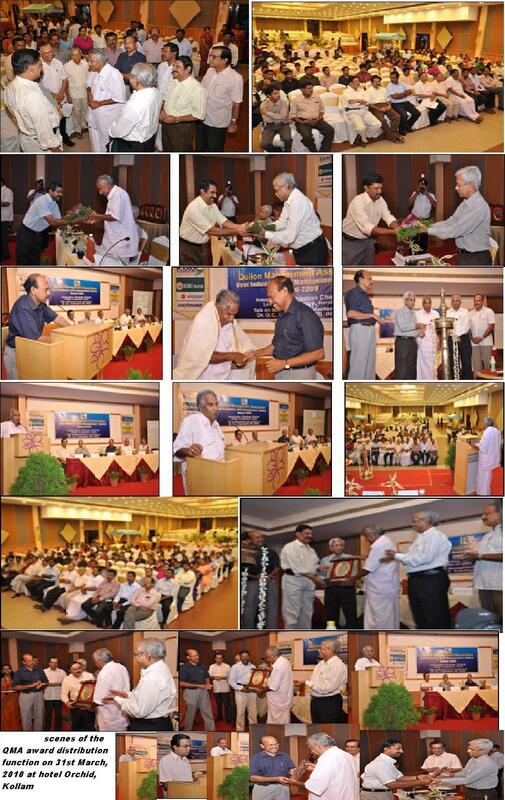 Photos of the event release of Book on PARTICLES OF UNIVERS of Prof. G.K. Sasidharan, former Vice-Chancellor, Calicut University, on 15th January, 2009 which was co-sponsored by QMA. Integrated Management Systems and CDM. 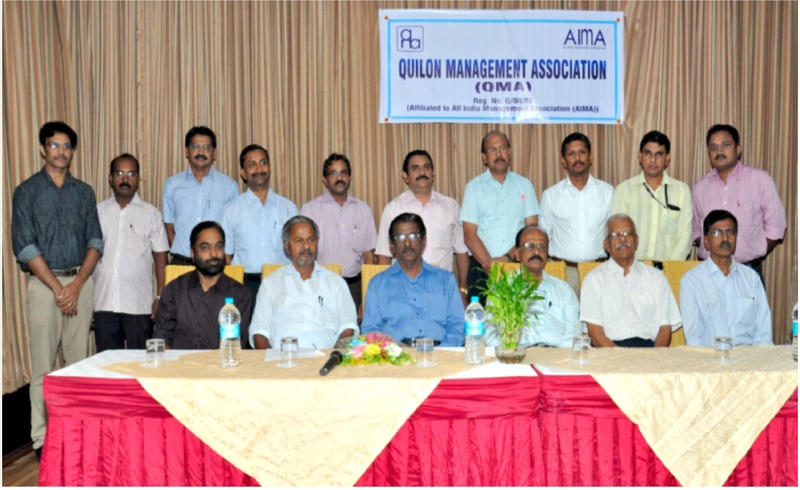 The Quilon management association conducted the monthly program on 7th January, 2010 at hotel Sudersan. Mr. B.G. Bhat was the chief guest of the day. Quilon Management Association organized industrial visit on 28/11/2009. The industry selected for the visit is the prestigious chemical industry of Govt. of Kerala The Kerala Minerals and Metals, Chavara. 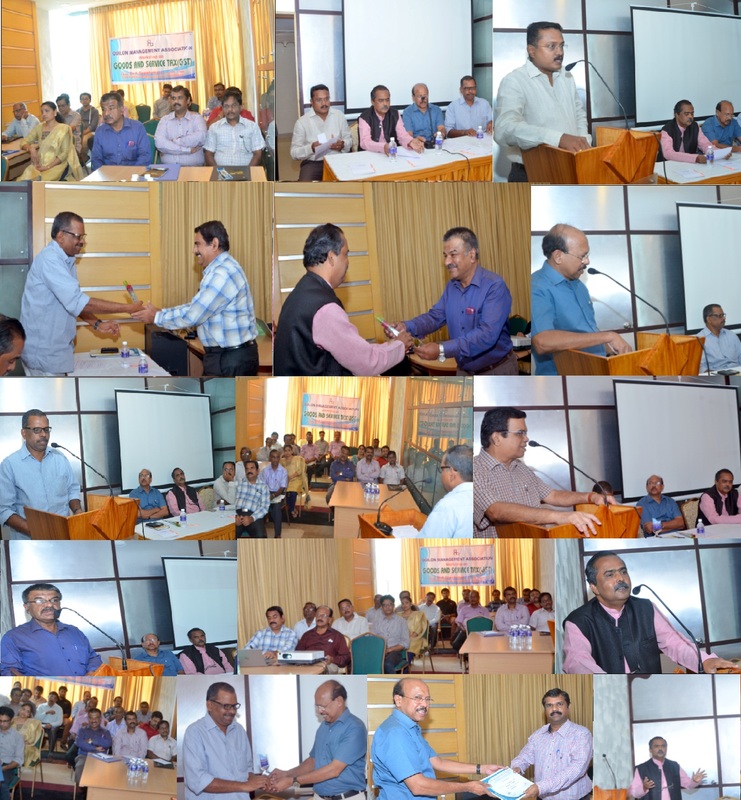 QMA president Sri P Rajendra Prasad welcomed the gathering at the guest house of KMML. Sri. K.V.Aravidakshan given a detailed presentation about the history of KMML process details and details of different plants. This industrial visit provided an insight on how companies work and also useful information related to the course which cannot be visualized in lectures. Down sizing manpower in recession will have disadvantages. 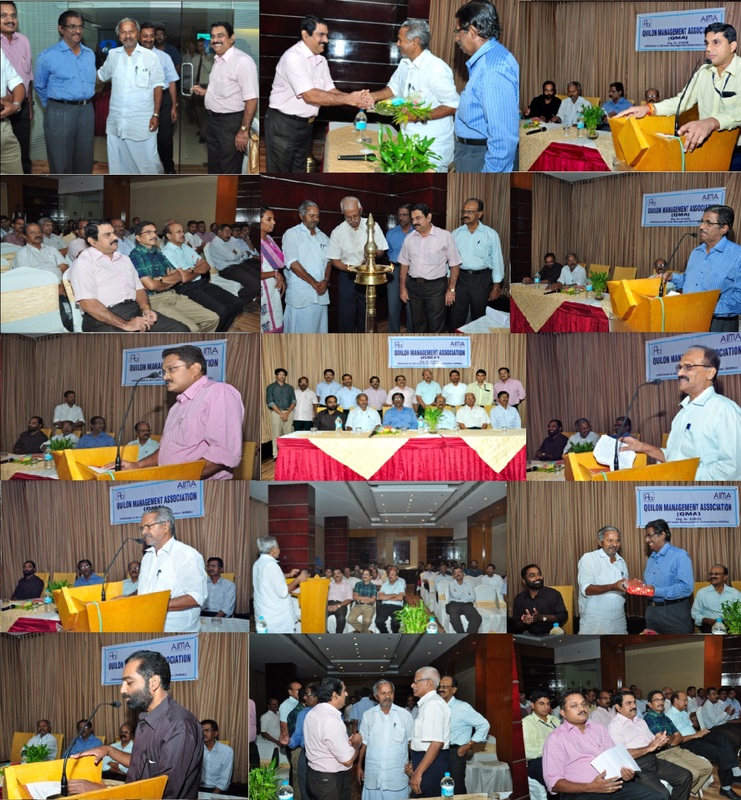 The Quilon management association and Indian Institute of Chemical Engineers (Trivandrum Region) conducted a joint meeting on 30th September, 2009 at hotel Sudersan. Dr. George Sleeba, CMD of FACT was the chief Guest. The topic for the day was THE NEW MANAGER. Dr. George Sleeba explained the concepts of new manager. The manager should be a contributor to the organization, The Manager should accomplish task within time disciplines and he should be one who foster innovation. The Manager should be visionary, essentially planning and creating a future. Dr. Sleeba has enlighten an interesting insight that managers and leaders should have regarding the 3 Cs. They should be contributors to the organization and should have commitment and they should be competent. Human resource is a great asset for any organization. Now in this recession most of the companies, capacity remains unused and constraint to reduce the production due to low demand. In this situation it is natural temptation to reduce manpower and get tactical advantage. This is incorrect and this is the time to retain and hire good talent and prepare for bright future. And we should make the recession as an opportunity. Is it wise to reduce the manpower if future is uncertain? This situation proves that all improvement steps people take to make plant lean is in vain if it cannot safeguard for adverse period like recession. ? 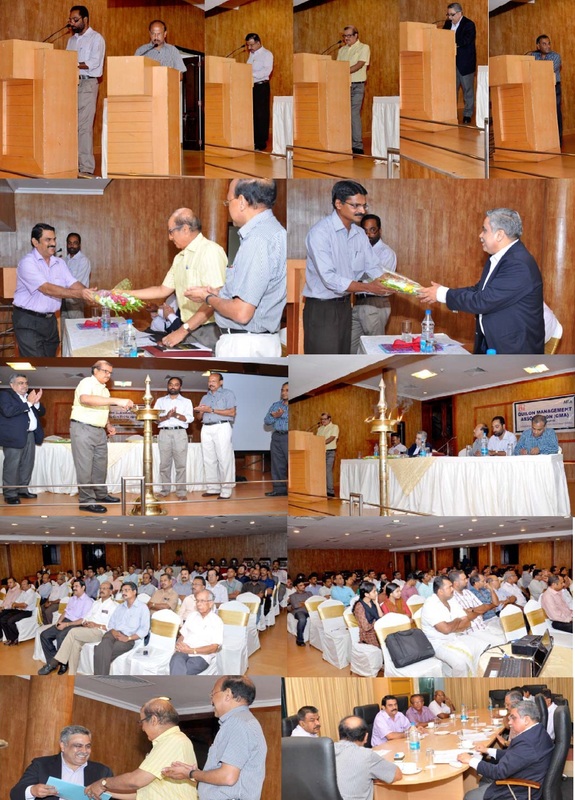 Dr. K.B.Radhakrishnan, Chairman of Indian Institute of Chemical Engineers, Trivandrum Region welcomed the dignitaries and followed by the presidential address of Sri Rajendra Prasad, President of QMA. Dr.S.N. Jyothi, Executive committee member of IIChe introduced the Chief guest to the gathering. The New Web site of QMA was inaugurated by Sri N. Padmalochanan, Worshipful Mayor of Kollam. Sri Padmalochanan in his inaugural address said that the young generation should be more employable in the competitive world. It is good to be a scholar or gold medalist in school and university. But unless he is employable he cannot survive. The real talented people will have competence, commitment and contribution and the competence means that individuals have the knowledge, skills, and value’s required today’s job and tomorrows. Success comes from vision, hard work and the out put of the individual to the organization. Sri. K.V.Aravindakshan explained the details and facilities available in the new web site of QMA. 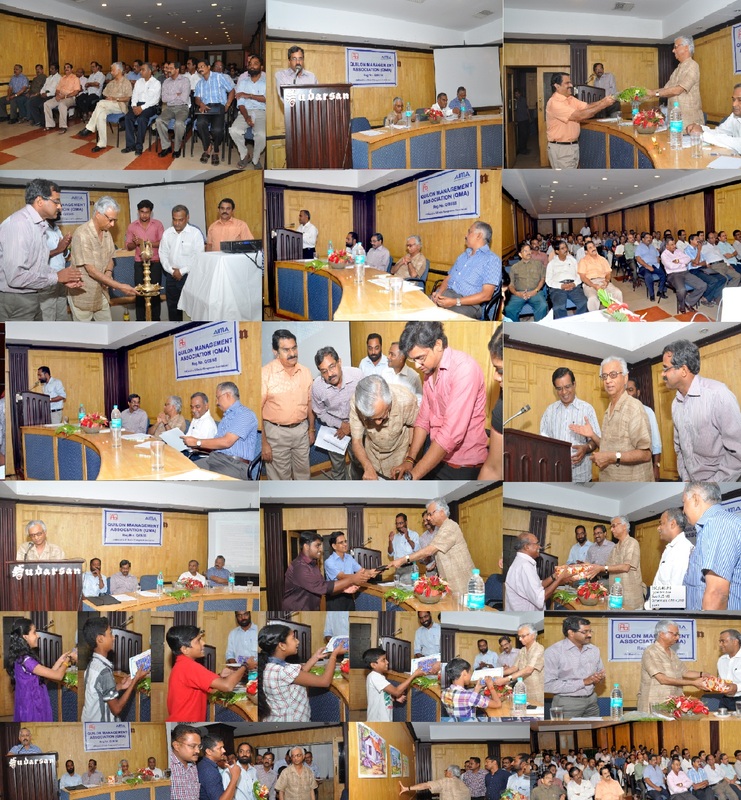 Felicitation talk was given by Dr.K.Sankaran and Mr.V.S.Radhakrsihnan proposed the vote of thanks. 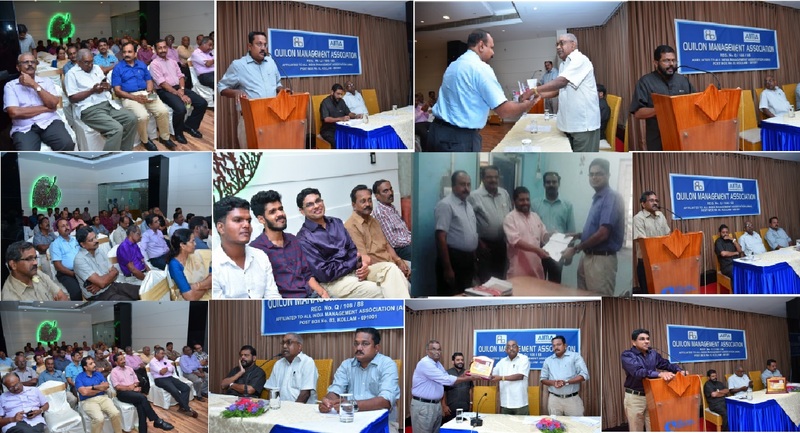 The Quilon management association conducted the installation meeting on Tuesday, 25th August 2009 at hotel Regant Lake Palace, Neendakara, Kollam. Sri. George Joseph former CMD of Syndicate Bank was the chief Guest to grace the Occasion. The installation of QMA President Sri. P Rajendra Prasad, AGM, KMML and his team of office bearers for the year 2009-10 was followed by a talk by the chief guest Sri. George Joseph on the subject ”Current Economic Scenario in the back drop of Global melt down‘.